THIS REPORT TEXT COMPARES APRIL FINDINGS TO MARCH FIGURES. CHARTS ARE QUARTERLY. 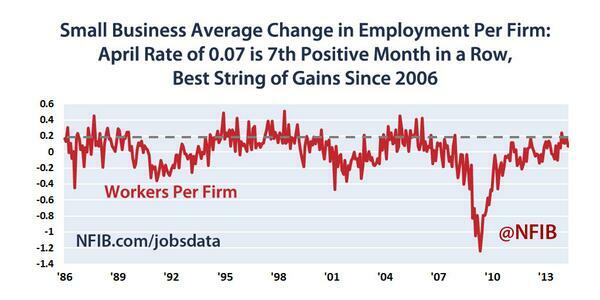 “NFIB owners increased employment by an average of 0.07 workers per firm in April (seasonally adjusted), weaker than March but the seventh positive month in a row and the best string of gains since 2006. Seasonally adjusted, 13 percent of the owners (up 2 points) reported adding an average of 3.1 workers per firm over the past few months. Offsetting that, 13 percent reduced employment (up 1 point) an average of 2.9 workers, producing the seasonally adjusted net gain of 0.07 workers per firm overall. “The remaining 74 percent of owners made no net change in employment. Fifty-one percent of the owners hired or tried to hire in the last three months and 41 percent reported few or no qualified applicants for open positions. “Twenty-four percent of all owners reported job openings they could not fill in the current period (up 2 points). This suggests that the unemployment could ease a tenth of a point or more. Fourteen percent reported using temporary workers, up 1 point from March. “Job creation plans reversed a recent negative trend and rose 3 percentage points to a seasonally adjusted net 8 percent, although still off from January’s 12 percent. Not seasonally adjusted, 20 percent plan to increase employment at their firm (down 1 point), and 4 percent plan reductions (down 2 points). Commemorating its 70th anniversary, the National Federation of Independent Business is the nation’s leading small-business association, with offices in Washington, D.C., and all 50 state capitals. Founded in 1943 as a nonprofit, nonpartisan organization, NFIB gives small- and independent-business owners a voice in shaping the public policy issues that affect their business. NFIB’s powerful network of grassroots activists sends its views directly to state and federal lawmakers through our unique member-only ballot, thus playing a critical role in supporting America’s free enterprise system. NFIB’s mission is to promote and protect the right of our members to own, operate and grow their businesses. More information about NFIB is available at www.NFIB.com/newsroom.